NSC (est. 1981) is a Canadian-owned company specializing in the aquatic environment. 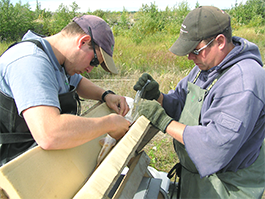 We have extensive project-related experience in freshwater, estuarine, and marine environments in areas ranging from the Canadian Arctic to the South Pacific. We serve clients in the electrical, oil and gas, transportation, pulp and paper, agriculture, and mining industries, as well as government and First Nations. NSC brings together a staff of talented individuals with recognized expertise in a broad array of aquatic and resource use disciplines allowing us to effectively and efficiently meet our client's needs using appropriate and innovative methods. Our senior staff have decades of experience providing environmental consulting expertise to clients, independently and as part of multi-disciplinary teams. 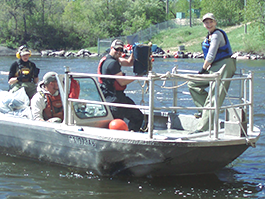 NSC has been conducting large scale aquatic field investigations and resource use studies for over 35 years. NSC employs cutting edge technologies to address our client's needs. Some of our capabilities include DIDSON sonar videography and radio and acoustic telemetry to track fish movements, real-time kinematic global positioning systems (GPS) coupled to scientific grade sonar to map habitats, a UAV/drone to capture remote sensing data (e.g., multispectral imagery, digital elevation models), boat electrofishing to live sample fish, and state of art water quality sampling equipment to collect in situ water quality data.